Offering charming style and everyday function, the STOREINDYA Wall Mounted Wall & Key Hook makes it easy to get organized and clean up unwanted clutter. The panel of graceful hooks creates added storage space-perfect for hanging convenience in lieu of a closet or a cumbersome floor-standing Wall & Key Hook. The versatile wall-mounted unit makes a great choice for small spaces or high-traffic areas around the home or office. The Store Indya Wall Mounted Wall & Key Hook installs quickly and easily. When properly mounted (to solid wood or studs), the rack offers reliable strength and optimal performance for everyday organizing and storage. Mounting hardware and installation instructions come included. This Product has been meticulously hand-crafted by artisans in India, one piece at a time. As each piece is unique you may notice slight variation. These characteristics make this piece truly one-of-a-kind. As a natural result of the manufacturing process, products can feature small irregularities and cracks. Colors can differ from the actual product as digital scanner and screens may not replicate the original color accurately. " ♥ ELEGANT DESIGN AND PERFECTLY SIZED: Beautifully hand crafted from the finest quality mango wood with natural finish. It is creatively shaped into 3 owls that depict an owl family. DIMENSION (12 inches x 6 inches (8.5 inches with the hook), it is perfectly sized to beautify the appearance of your wall. 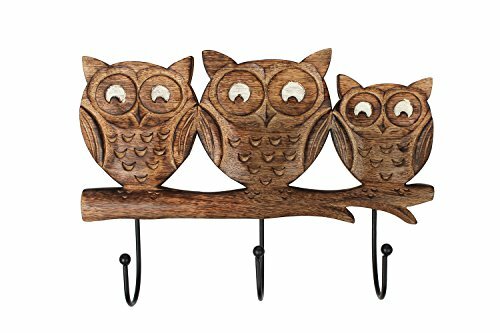 ♥ STURDY AND DURABLE WALL HOOKS: This pair of owl coat hanger is strong and firm that holds each item securely, so now no longer need to worry about falling. It consists of 3 sturdy metal hooks. ♥ WIDE APPLICATIONS: It is an amazing wall décor furnishing and conversational piece. Adds a fun element to your plain and boring wall and makes it look interesting. Hang it anywhere near entryway, kid's bedroom, nursery, bathroom or any other place where an extra hook is needed. It comes with easy installation feature. ♥ CLASSY GIFT: Creatively designed wall hooks are perfect gift to send to friends and family. This wall hook can be gifted on the occasion of Mother's Day, Father's Day, Housewarming, Birthday, Christmas & New Year. It is one of the most thoughtful gift you can give your loved ones!